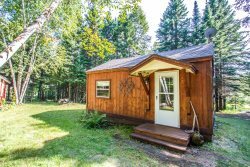 Superior Shores 6 is a cozy one bedroom, one bathroom cabin on the shores of Lake Superior near Grand Marais, MN. This quaint vacation rental cabin is located on the popular Croftville Road. Enjoy being just steps away from Lake Superior, where you can open your windows and hear the waves crashing against the shoreline. You are just steps from a shared cobblestone beach. The large windows allow tons of natural light into this cozy little cabin. Note: The cabin now has a new, more comfortable couch. Sit back and relax in the living room while watching the lake outside. Imagine having a cup of coffee in the morning at this table when this is your view. You are literally just feet away from the lake. Enjoy the dramatic view outside of the living room window. Enjoy the gas fireplace, the only source of heat in this cabin. The kitchen is small but well equipped for preparing meals during your stay. The bedroom features a full bed and window for natural light. The bathroom features a walk-in shower. The cabin is easy access and located all on one level. Step out onto your deck with a cup of coffee and a good book and let the lake be your companion. Nothing but Lake Superior for as far as the eye can see. The deck provides plenty of space to sit, to relax, read a book, eat a meal, or just enjoy the lake. Whether you are inside at the dining table or outside on the deck, you will be amazed by the beauty of Lake Superior. Consider Superior Shores 6 for your next North Shore vacation. This cabin is right on the water's edge and only minutes away from Grand Marais. Perfect for one to two people to enjoy a quiet vacation on the shore. Simple, but fully equipped kitchen, newly remodeled bathroom, cozy bedroom, gas fireplace, and amazing lake views are all on one easy access level. This is a great location on the quiet Croftville Road. Open the lake-facing windows and enjoy the peaceful sounds of Lake Superior and, if you're lucky, you may see the Northern Lights from the comfort of your private little cabin at Superior Shores #6, From the moment you arrive this cabin will charm and relax you. If you are looking for a place that is unique and away from the hectic pace that life can sometimes demand, this is it. This cabin is nestled in a group of cabins that were once a mom and pop resort. Now individually owned there are only a few that are still rented to vacationers. The cabin is conveniently located only a few miles from Grand Marais and the head of the Gunflint Trail. Get up early and take your cup of coffee on the deck to watch the sun emerge from the lake. Watch as the fog lifts off the lake and moves slowly across the land covering everything with fingers of eerie dew. On clear nights, lie on the deck and watch shooting stars overhead. Allergy Warning: Guests with pet allergies should be aware that while Superior Shores 6 is NOT a pet-friendly rental, the owner has a dog and there may be some hair/dander present. Please Note: The gas fireplace is the only heat source. Due to the cabin's small size and close proximity to the water, it is not recommended for small children. Being so close to the water was fabulous! The weather was superb! Lovely, clean and perfect. Nice new sofa. No need for a TV or even wireless. The cabin was beautiful and looked exactly like the pictures. The view was great and the neighbors were quiet and peaceful. It was my first time in Grand Marais and also my first time staying and booking a cabin; and the whole process was easy! My boyfriend and I had such a nice get away with this cabin. This cabin was well equipped and made it easier for us to cook and clean up. The only thing that kind of bothered us was that there was some dog or cat hair on the couch and bed. I'm not super allergic to animals, but sometimes I do get itchy when i touch their fur. But we managed and used our own blankets. However, everything else was great. Waking up to the sound of waves and sun shining on the lake was the cherry on top! We will definitely come here again. Also, it will be useful to have a parking sign (by the cabin) too, since the neighbors lived so close, we didn't know if we were using up their space for parking or not. But checking in and out was easy, and we really wished that the check out time wasn't 10am, we still wanted to stay and watch the waves! It was a wonderful getaway. We expected simple amenities, but found a surprisingly well-stocked kitchen. The blue fire sign was missing, making it difficult to find our cabin. The driveway is very nondescript, a bit overgrown, and says "private drive" so we drove past it the first time. Absolutely nothing says "Superior Shores" anywhere, so it is a good thing we had seen photos of the cabin online or we would have thought we were in the wrong place. It was another great stay waves lulled us to sleep! Perfect weather! We've stayed in many places around Grand Marais over the years. This cabin was absolutely lovely! It is cozy, and reminiscent of Grandma's cabin, but a cut above. It's well equipped and perfect for two. The best part is the unbelievable location, literally on the lake. We typically do a lot of hiking when we're up there, but the deck was so wonderful, we spent a lot of time sitting out listening to the waves and occasionally getting splashed. That's how close it is! We highly recommend it and have already recommended it to friends. It was a very relaxing weekend for me and my wife, the cabin was awesome. we will be back. Amazing cabin! Loved being so close to the lake, listening to the waves with the fire going was beyond relaxing! Will be coming back for sure!! Only complaint would be the fact that the other cabins are right next to you, but even then, we hardly noticed them. We love the location so close to the water. We also like the simplicity of the cabin itself. We do wish the beach access was closer/easier. We are avid kayakers and the beach is all lg rocks. But we still love the location & intimacy of the cabin.